An African American man who works at another optometry shop across the street from Richard’s in Memphis, Harrison later agrees to box with Richard to entertain the white workers in that neighborhood. After the fight, both Richard and Harrison are ashamed of their performance for their white racist “co-workers,” and the two speak very little to one another again. 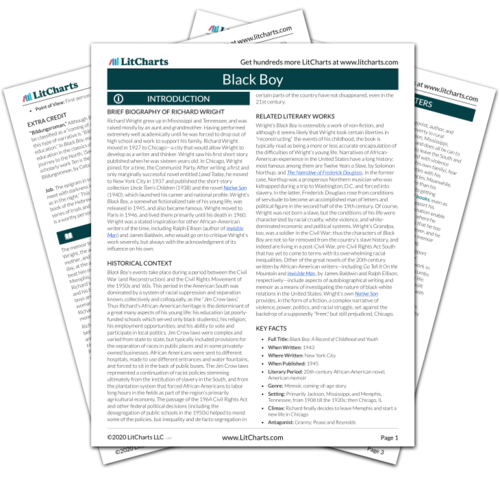 The timeline below shows where the character Harrison appears in Black Boy. The colored dots and icons indicate which themes are associated with that appearance. Schlegel, Chris. "Black Boy Characters: Harrison." LitCharts. LitCharts LLC, 18 Jun 2014. Web. 25 Apr 2019. Schlegel, Chris. "Black Boy Characters: Harrison." LitCharts LLC, June 18, 2014. 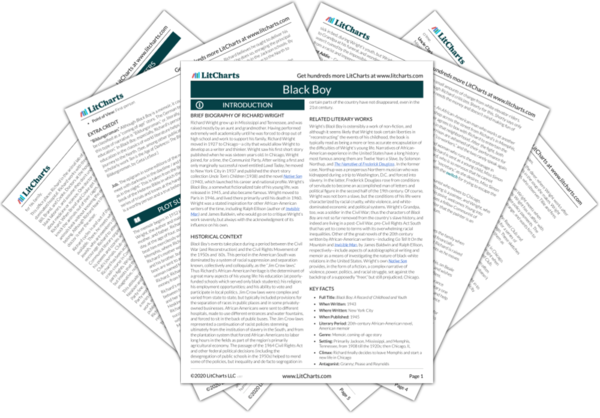 Retrieved April 25, 2019. https://www.litcharts.com/lit/black-boy/characters/harrison.